Content marketing needs a lot of tracking on the areas such as number of website visitors, engagement with post, resonance of topic area, effectiveness of headline, best day/ times to post to reach objectives, demographics/ psychographics of readers or viewers, website metrics for posts such as time on site, bounce rate funnel optimization from post or where visitors went after reading. Social Media Strategy Summit has collected 25 Content Marketing Tools for curation, creation, promotion & distribution, as well as analytics & tracking, including brands that use those tools, what’s great about the tools and who the tools would work best for. 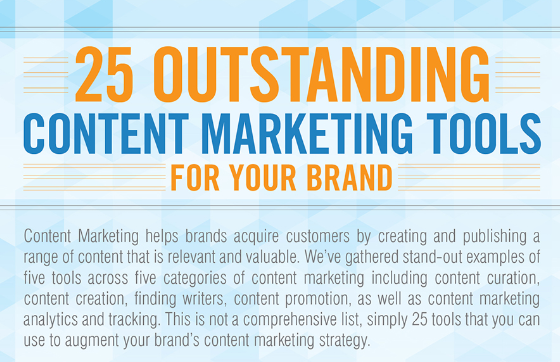 Here is a nice inforgraphic which explains 25 outstanding content marketing tools for your brand.